Find My Workspace lists over 95% of the business centres market in Walsall. Simply click Request Quote to check pricing for one office, or Add to Basket for multiple offices. This workspace offers large and spacious offices, providing a place for your business to grow and strengthen. Offering suites for 1 to 20 people, there is sure to be an office or suite to suit everyone. Set around a beautifully landscaped courtyard, these ground floor offices have beautiful views to admire while you work. The relaxed and aesthetic outdoor area provides a great space to spend lunch during the summer months and provides an alternative space in which to work away from the desk. The centre also features a meeting and conference room great for meeting clients or holding seminars. The space has also recently undergone some improvement works and now features brand new lighting and heating throughout as well as a newly installed kitchen/breakout area. Further facilities include; on-site car parking, unbranded office suites and 24-hour access to the building. A range of office space available from £300 pcm. 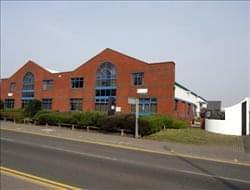 The offices are located within a business centre in the popular area of Blakenall. The centre offers a range of services and facilities designed to help small and large businesses to get a head start, including access to reception staff. Easily accessible by road and public transport and having a secure car park in place.